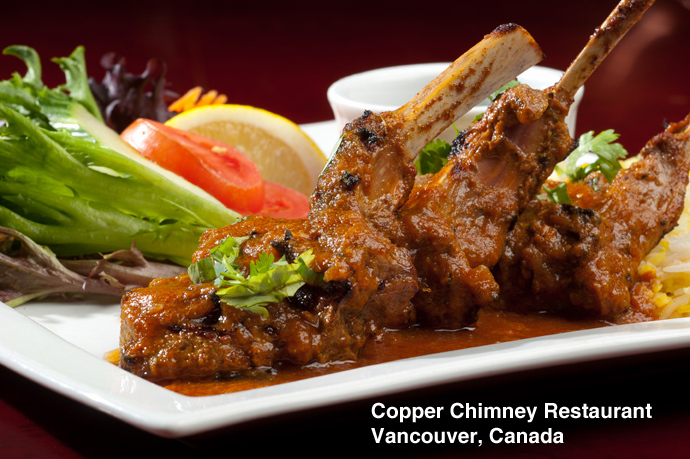 Irashai Grill (web site, map, 1368 West Pender Street, Vancouver, BC, Canada, 604-688-8697) is a newly opened Japanese fusion restaurant in the Coal Harbour neighborhood of downtown Vancouver. Having attended their open house a few weeks ago (see Part 1), I was interested in trying out the restaurant for an actual meal. I was in for a real treat! 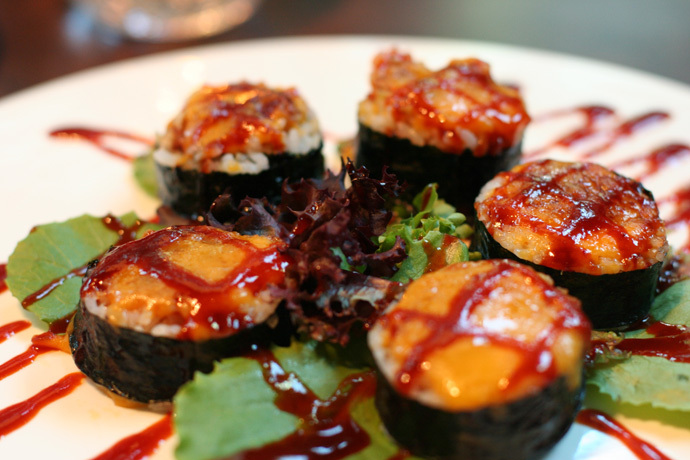 My friend and I first ordered the Dragon Roll Sushi ($13.50, pictured below), which looked and tasted amazing. 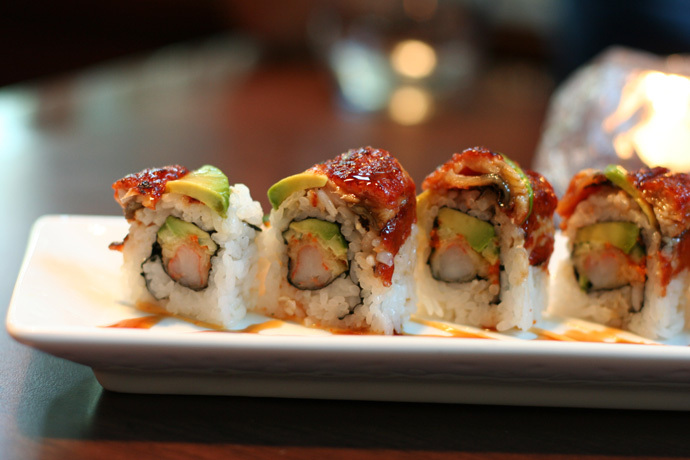 The Dragon Roll was on their special rolls menu (not listed on their web site) and was a creation made with shrimp, tempura, avocado, barbecued eel (unagi), and of course the sushi rice and nori seaweed. It was quite sweet tasting (because of the sauce that the eel is marinated with), and was light and immensely satisfying. I commented to my friend that I could easily eat one of these every day. If only I could afford it! The Tako Sunomono (a cold salad made with octopus, vermicelli noodles and a sweet and tangy vinegary broth) was $7.50 and was presented very nicely in a large cocktail glass (pictured below). It is one of my favorite appetizers at Japanese restaurants and the Irashai version did not disappoint! I would have liked it to be bigger, but that is just my wishful thinking because it was a decent size for an appetizer after all. Now comes to the most interesting part of the meal. We were perusing the menu and discovered a very unusual sounding sushi roll item. Unusual I say? Yes! I’ll explain. In general, for creative dishes that are designed by the chef using a culinary “artistic license”, the name of the dish, if it is somewhat abstract and not a simple description of the ingredients, will relate to the theme of the dish in some way. What this means is, I was curious to see exactly what a Poison Spider Volcano would taste like. No kidding! Would there be an actual spider involved in this sushi, and would this spider have some sort of deadly poison? Also it was very important for me to find out how a volcano would be represented in the form of rice and other sushi-like ingredients on a dinner plate. The good old poison spider and its friendly volcano home ($16, pictured below) was made with asparagus, soft shell crab, cream cheese, and was sprinkled with cheese. It was baked before serving and then topped with a super spicy miso sauce. Super spicy is an understatement! The powerful spicy sauce reminded me of the Crazy Boy Roll at Mr. Sushi but the Poison Spider Volcano sushi had a much more complex and rich flavor (thanks to the cheese and cream cheese). It was very filling, which is a good thing in my books. My vote: thumbs up, but the sauce was too spicy for my friend. For dessert we tried their Marscapone Tiramisu ($5.50, also pictured below) which was a generous amount of cool sweet marscapone cheese served in an interesting ceramic tray topped with a layer of dusted cocoa. The cocoa was very fine and powdery. This was a wonderful contrasting dish to calm things down after the spicy spider! Tako Sunomono Salad ($7.50) from Irashai Grill in Vancouver BC Canada. Poison Spider Volcano Sushi ($16.00) from Irashai Japanese Restaurant in Coal Harbor, downtown Vancouver BC Canada. 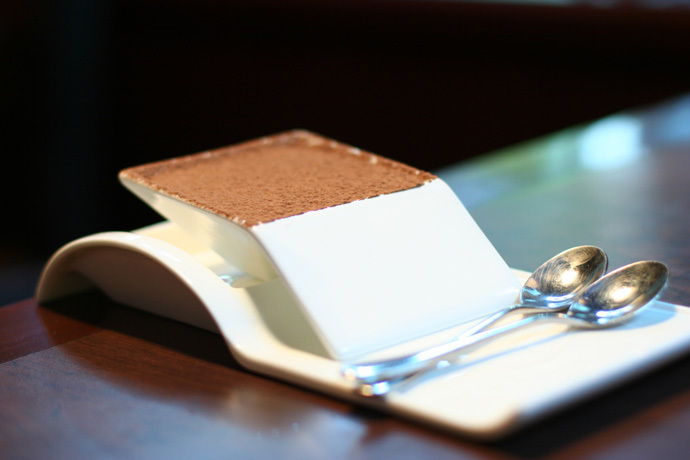 Marscarpone Tiramisu dessert ($5.50) from Irashai Grill Japanese fusion restaurant in downtown Vancouver BC Canada. Gorilla Food (map, web site, 101 – 436 Richards St. Vancouver, BC, Canada, phone: 604-722-2504) is currently one of the only restaurants in Vancouver that serves all raw, vegan, and organic foods. I have a friend who follows a raw vegan diet, which means that he doesn’t eat any animal-related products (vegan) and foods must be unprocessed and not heated above 46 degrees Celsius (raw). He blogs about the Raw Vegan lifestyle on Eat Raw Vegan. I was interested to see what a Raw Vegan meal would taste like! Raw Vegan food preparation takes a lot of creativity to make food that is satisfying and interesting to eat without using cooked or processed ingredients, and without meat or dairy products. Amazingly, all the dishes pictured below are raw vegan dishes. I must say that I was quite happy and full after the meal. 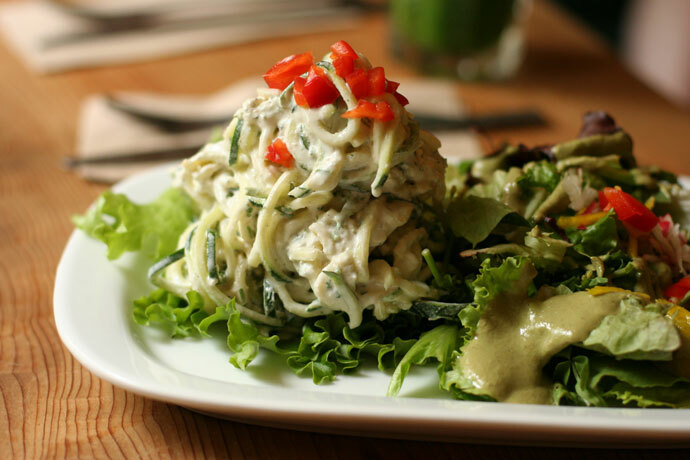 The Raw Vegan Cashew Alfredo Zucchini Linguini ($10, pictured below) was made with zucchini “newdles” smothered in a rich white cashew cream. It was served with a green leaf salad. It tasted cool and refreshing, and was amazingly creamy considering that no dairy products were used. The Maui Waui raw vegan pizza ($6.00, also pictured below) is a sun-dried tomato and fresh tomato herb sauce topped with a mix of tenderized kale and seasonal greens then topped with fresh pineapple bits and a crumbly walnut “cheez”. 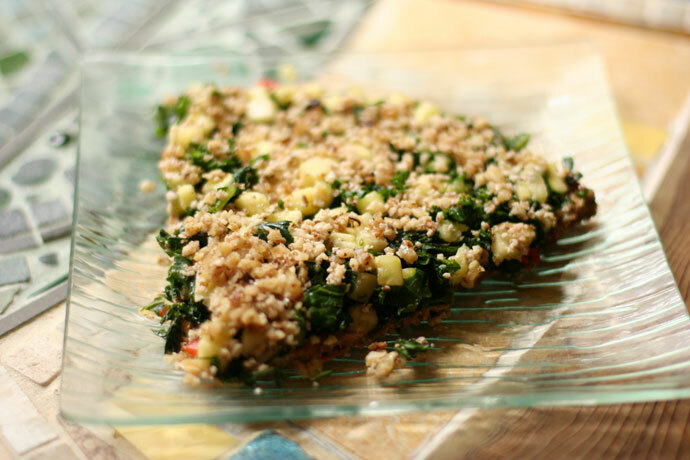 It is served with a sprouted sunflower and buckwheat, flax and carrot crust. For an appetizer we also tried the Raw Vegan Zucchini Hummus and Crackers ($7.50, pictured below). This tasted amazingly good, better than ordinary hummus I thought! 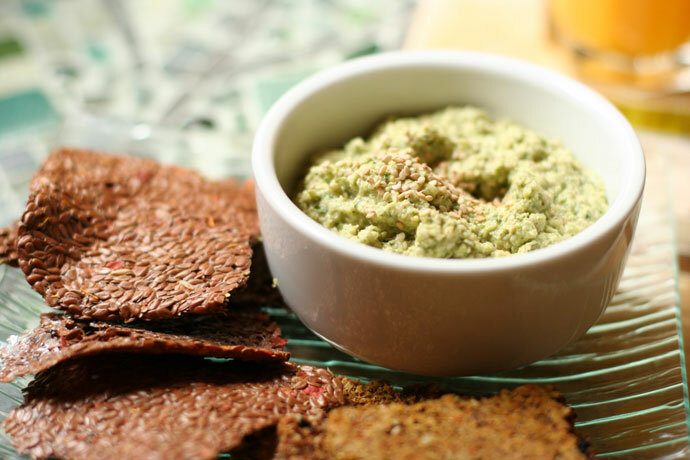 The bean-free garlicky hummus dip is served with house-dehydrated crackers. Other notable items included the Freshly Squeezed Orange Juice ($5.25, pictured below) – this is heavenly if you like orange juice; in fact I thought it was some of the best orange juice I have had in Vancouver! The raw vegan chocolate cake (also pictured below) was really fudgey and chocolatey, a treat not to miss! The restaurant is open every day from 11am until 5pm. Maui Waui Pizza ($6.00) raw vegan food from Gorilla Food restaurant in downtown Vancouver. 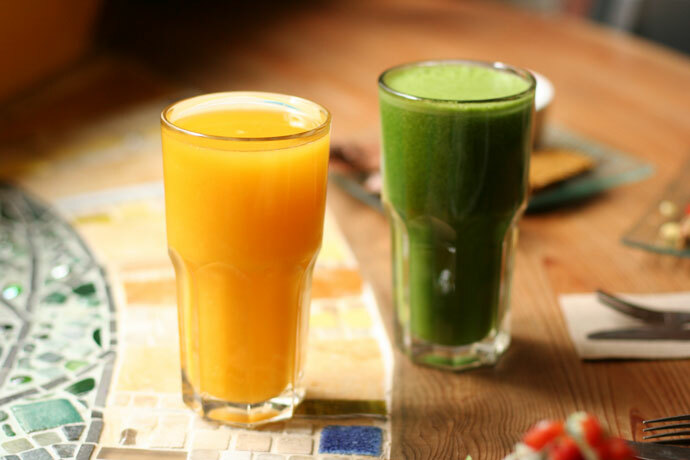 Fresh orange juice ($5.25) and Green Glory drink ($5.50) from Gorilla Foods in Vancouver. Raw Vegan Zucchini Hummus and Crackers ($7.50) from Gorilla Foods in Vancouver. 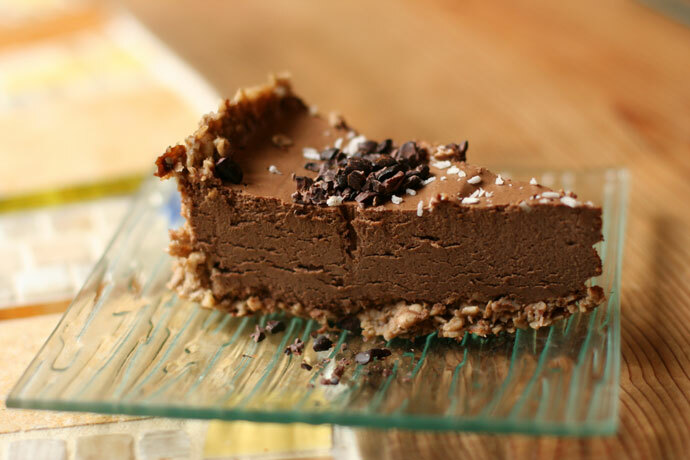 Raw Vegan Chocolate Cake! (From Gorilla Food in Vancouver, downtown). 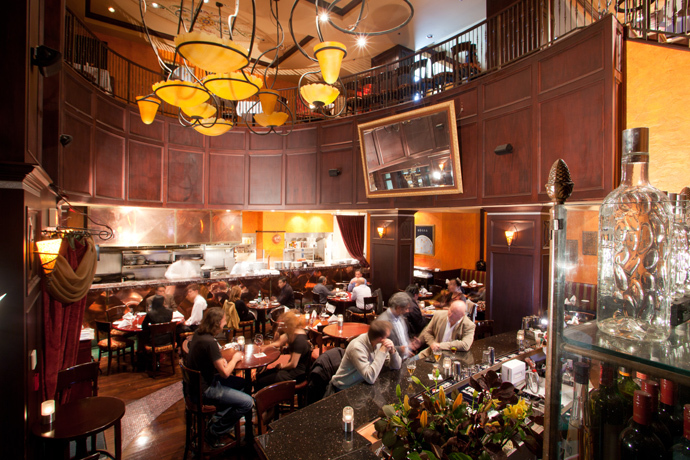 View More Restaurants in the Fusion category. 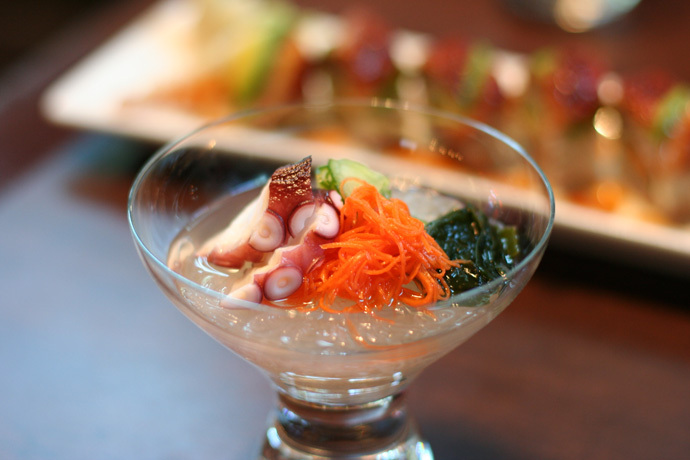 We hope you enjoy the great Fusion restaurants on Dine Out Here Vancouver.